Peter, who was also known as Simon Peter of Cephas, is considered the first Pope. Despite his papacy, Peter had humble beginnings and became one of the Twelve Apostles of Jesus. He was ordained by Jesus in the "Rock of My Church" written in Matthew 16:17-18, which says, "Jesus replied, 'Simon son of Jonah, you are a blessed man! His feast day is June 29. Saint Peter the Apostle, original name Simeon, or Simōn (died c. ad 64, Rome), disciple of Jesus Christ, recognized in the early Christian church as the leader of the disciples and by the Roman Catholic church as the first of its unbroken succession of popes. 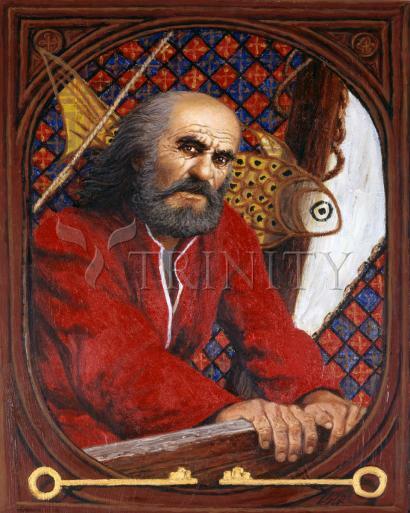 Peter, a fisherman, was called to be a disciple of Jesus at the beginning of his ministry. He received from Jesus the name Cephas (i.e., Rock, hence Peter, from the Latin petra). The sources of information concerning the life of Peter are limited to the New Testament: the four Gospels, Acts, the letters of Paul, and the two letters that bear the name of Peter. He probably was known originally by the Hebrew name Simeon or the Greek form of that name, Simōn. The former appears only twice in the New Testament; the latter, 49 times. At solemn moments (Gospel According to John 21:15) he was called “Simon, son of John.” The Gospel According to John prefers Simon (17 times) or the compound, rarely found elsewhere, of Simon Peter. Though Paul has a distinct preference (8 times out of 10) for the Greek transliteration Kēphas (Latinized as Cephas) of the Aramaic name or title Kepha, meaning “rock,” the Gospels and Acts use the Greek translation Petros approximately 150 times. From the Synoptic Gospels (Gospel According to Matthew 8:14) and Paul (First Letter of Paul to the Corinthians 9:5), there is indirect evidence that Peter was the son of John and was married. His family originally came from Bethsaida (John 1:44), but during the period of Jesus’ ministry he lived in Capernaum, at the northwest end of the Sea of Galilee, where he and his brother Andrew were in partnership as fishermen with James and John, the sons of Zebedee (Gospel According to Luke 5:10). Much can be learned about Peter from the New Testament—either explicitly from the statements made by and about Peter or indirectly from his actions and reactions as revealed in a number of episodes in which he figures prominently. He was at times vacillating and unsure, as in his relations with the church of Antioch when he at first ate with the Gentiles and later refused to do so (Letter of Paul to the Galatians 2:11–14); he could also be resolute (Acts of the Apostles 4:10; 5:1–10). Occasionally he is depicted as rash and hasty (Luke 22:33, etc.) or irritable and capable of great anger (John 18:10). Often he is pictured as gentle but firm and, as in his professions of love to Jesus, capable of great loyalty and love (John 21:15–17). The Gospels agree that Peter was called to be a disciple of Jesus at the beginning of his ministry, but when and where the event took place is recorded differently in the several Gospels. Luke (5:1–11) scarcely mentions James and John and omits Andrew while emphasizing the call of Peter. Matthew (4:18–22) and Mark (Gospel According to Mark 1:16–20) note the call of the four men and—with Luke—agree that the event took place at the Sea of Galilee. The Gospel According to John places the call in Judaea (1:28) and states that Andrew—who had been a follower of John the Baptist (1:35) and had heard John indicate that Jesus was the Lamb of God—left John and introduced Peter to “the Messiah,” who at that time gave him the name (or title) Cephas (i.e., Peter, or Rock). The Synoptic Gospels (Matthew, Mark, and Luke) are probably correct in recording that the call to Peter was extended in Galilee when Jesus first began his work in that area. The Gospel According to John is here, as elsewhere, perhaps more theologically than historically motivated; the author of John wishes to stress that Peter recognized Jesus’ Messiahship from the beginning and that Jesus had seen Simon as the rock from their first meeting. The Synoptic Gospels largely agree in the amount of emphasis each gives to the leadership of Peter among the Twelve Apostles, but there are differences also. For example, in one case Matthew and Luke note that Peter was the speaker in questioning Jesus about a parable, but Mark has attributed these words to the group of disciples (see Matthew 15:15; Luke 8:45; and Mark 7:17). With differing degrees of emphasis, the Synoptic Gospels agree that Peter served as spokesman, the outstanding member of the group, and enjoyed a certain precedence over the other disciples. Whenever the disciples are listed, Peter is invariably mentioned first (Matthew 10:2–4; Mark 3:16–19; Luke 6:14–16; Acts 1:13; compare only Galatians 2:9). Although it is not certain whether or not this priority is due primarily to reading back into the Gospel narrative Peter’s importance in the apostolic church, his forceful personality was surely a factor. Those not belonging to the immediate followers of Jesus also recognized the authority of Peter, such as when the collectors of the temple tax approached him for information (Matthew 17:24). Again, with characteristic quickness he sought a clarification from Jesus on behalf of the disciples concerning the meaning of a parable (Matthew 15:15) or of a saying (Matthew 18:21). As both an individual and representative of the Twelve Apostles, he made a plea for personal preference in the Kingdom of Heaven as a reward for faithful service (Matthew 19:27, 28). On several occasions Peter alone is mentioned by name, and others are indicated as merely accompanying him (Mark 1:36; Luke 8:45). Even when the three disciples closest to Jesus (the “pillars”—Peter, James, and John) figure in a particular incident, it is frequently Peter alone who is named. When the three are named, Peter’s name invariably appears first (as in Matthew 17:1, 26:37). It was his home in Capernaum that Jesus visited, when he cured Peter’s mother-in-law (Matthew 8:14); it was Peter’s boat that Jesus used when he instructed the crowd (Luke 5:3). It was Peter who possessed remarkable insight and displayed his depth of faith in the confession of Christ as the Son of God (Matthew 16:15–18; Mark 8:29; Luke 9:20); and it was Peter who rebuked and in turn was rebuked by Jesus when the Master prophesied that he would suffer and die (Mark 8:32, 33). It was also Peter who manifested the momentary weakness of even the strongest in the denial of his Lord (Matthew 26:69–75; Mark 14:66–72; Luke 22:54–61). Later, however, with greater maturity, he discovered strength and, as he was charged by Jesus (Luke 22:31, 32), effected the strengthening of others. Finally, Peter, who survived his denial, was permitted to be the first witness of the Resurrection (Luke 24:34). In the Fourth Gospel, the prominence of Peter is challenged in the person of John, the “Beloved Disciple.” Though Peter receives mention in John 37 times (out of a total of 109 times in the four Gospels), one-third of the references are found in the appendix (chapter 21), and he appears in only 9 incidents. The Gospel According to John attempts to show the close relationship between John and Jesus while still reserving to Peter the role of representative and spokesman. The fact that Peter is emphasized in John and charged by Jesus to “tend my sheep” and “feed my lambs” (John 21:15,16) at the same time that the role of the disciples as a whole is being deemphasized attests to the prestige of Peter in the apostolic church. But throughout the Fourth Gospel Peter shares his prominence with John (13:24; 18:15; 19:26, 27, etc.). Among the purposes of chapter 21 in emphasizing Peter may well be an attempt to restore the disciple who denied his Lord to the position he enjoyed in the Synoptic Gospels.